The opening missions sees your chosen protagonist fleeing Dunwall and catching a ship to the Serkonan city of Karnaca, where the plan to overthrow Emily was hatched. In the process, Arkane reintroduces players to the base mechanics, without the added complication of magical powers. Instead you’re forced to closely watch guard patrols and evade them with good old-fashioned sneaking, or simply carve a path through them with Dishonored’s satisfying one-two combo of sword and pistol. If you so choose you can play the entire game this way, forgoing magic by refusing the mark of the Outsider, the aloof and condescending god who watches the world as if it were an HBO drama. 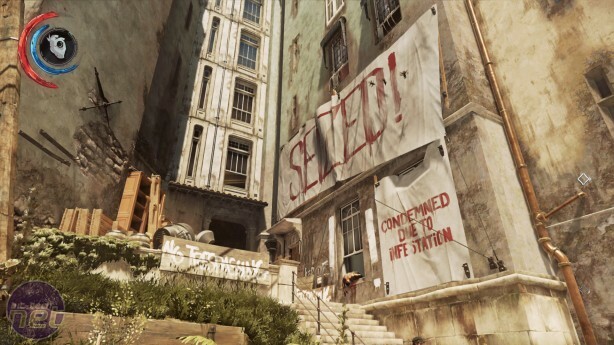 That this is even possible shows the attention to detail of Dishonored 2’s level design. So much of the game is about verticality, using rooftops, ledges and balconies to your advantage. The flight from Dunwall demonstrates this in impressively opulent fashion, and it is but a taste of what is to come. 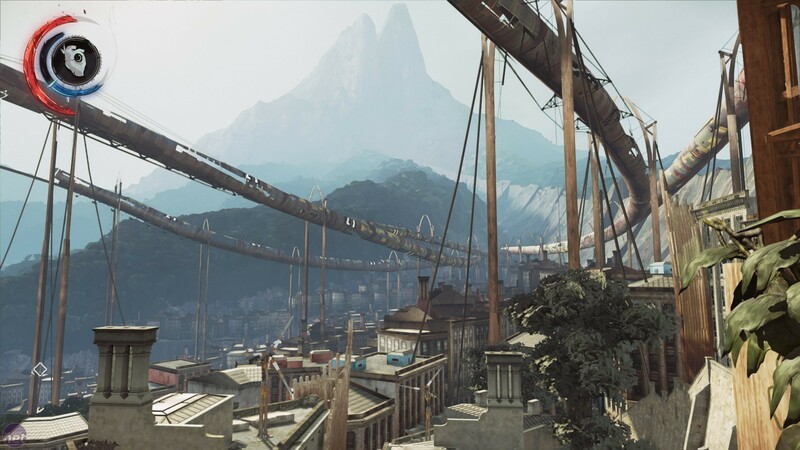 Karnaca is where most of the game takes place. The southern city is at once familiar and alien to Dunwall, boasting similar architecture and with the same caricature-proportioned citizens wandering its streets. But the smoggy, chilly estuary plain Dunwall is built on is a far cry from Karnaca’s searing sub-tropical hillside, its topography strongly evoking Rio de Janeiro. Karnaca is at once beautiful and squalid, its neoclassical town houses and modernist mansions are undercut by dirty streets and dank cellars, while an entire district is choked and pummelled by fierce dust storms. You can almost smell the decay in its rubbish-strewn back-alleys and the condemned apartments, which play host to terrifying infestations of bloodflies. These giant, droning insect swarms are core to Dishonored 2’s Chaos system. Each fresh corpse you leave in your wake provides more incubation for bloodfly eggs, which in turn results in more death and destruction in the city around you. While technically a smaller city than Dunwall, from the player’s perspective Karnaca is a much larger area to explore. The city sections that preceded several of Dishonored’s missions are now standard in Dishonored 2, considerably expanded and phenomenally detailed. Each of these majestic urban mazes can easily absorb an hour or two. You can break into shops and apartments in search of valuable items or power-upgrading runes, or embark upon side missions such as stealing a body from a local outpost of the Overseer cult, or putting an end to a civil war that rages through the Dust District. 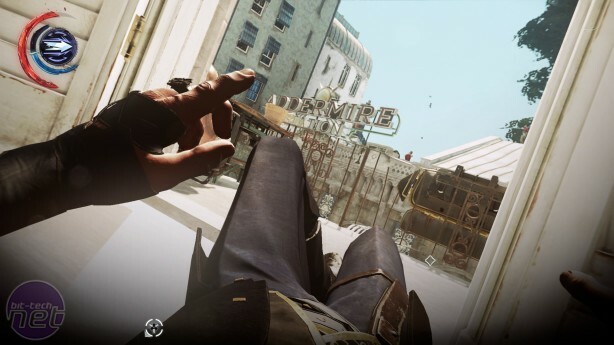 Alternatively you can spend that time simply messing around with Dishonored’s glorious toy-box of abilities. For Corvo, these are largely the same as before, albeit with a few tweaks. 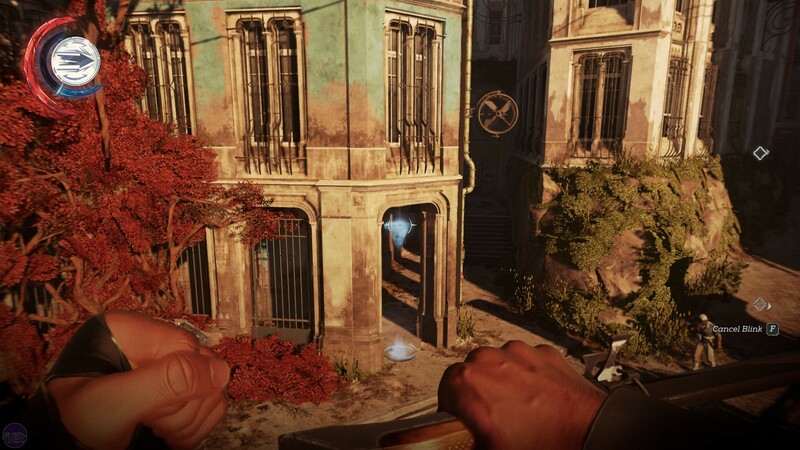 For example, Blink can now be upgraded so that time freezes when you don’t move, as in Dishonored’s Knife of Dunwall expansion, while Dark Vision can be altered to show you the intended routes of guards and other enemies. Emily, meanwhile, gains access to an entirely new set of powers, including by far and away the best of both games: Domino. This ingenious ability lets you link the fates of up to four enemies. Shoot one with a tranquilliser; they’ll all fall unconscious. Kick one off a cliff; they’ll all die. The very first time I used it, I linked two enemies patrolling a corridor. I then grabbed one to choke him out, but as I was doing so the other guard turned around and spotted me. She pulled out her pistol and fired, but the bullet struck the guard I was choking and killed him, which of course meant that she immediately dropped dead as well. It was brilliant. Alongside Domino, Emily can summon a clone of herself with Doppelganger, who can lead enemies away from you or even fight them directly, and transform into a smoky demon-like creature using Shadow Walk. In this form, Emily moves quieter, can slip through vents and other small gaps, and tear enemies to pieces with her inky claws. Emily even has her own version of Blink called Far Reach. I found it to be both slower and fiddlier than Corvo’s revolutionary teleport ability, but it can be upgraded to pull objects and even enemies into Emily’s clutches from a distance.